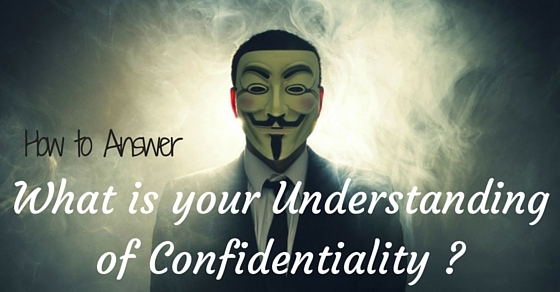 Confidentiality interview is an important yet most personal thing of the employee and focus should be made on such things. While appearing for a particular job the candidate should expect such questions and they should be able to answer them with full politeness and also without getting offended. Often it happens that the person conducting the interview asks some personal details about the person as they expect the other person to share all the information without hiding it from the interviewer. The candidate asked for the personal details about any specific reason should be polite and should not feel offended without any reason. They should know the reason behind the recruiter asking them such questions regarding their previous work. Even if they do not want to answer about the question being asked they should at the very first place politely deny the questions without hurting the feelings of the other person. This politeness helps to win the situation and also help to gain the other person’s confidence. By being trustworthy what is depicted here is the person should somehow know how to manage the thing and in a way that will help the other person to gain trust in them. They should be honest about whatever they say and they should show their trust for the company they will be working in and for the previous company as well. They should not just show all the secret information about the previous company and should show their trust. This will help the other person to appreciate them and will be a trust booster. If any secret is being said to them then they should feel that they are completely responsible for that secret and should be able to keep that secret alive within them without saying it in front of everyone. If any important password is shared with them they should understand the depth of the password or the responsibility given to them and should focus of keeping it with themselves and not displaying it everywhere. By keeping the secrets one should be highly acceptable with everything and yet being secretive. By following the rules and regulations completely one should understand the depth of the rules and should follow whatever comes to us. We will not be asked to follow something which is unexpected or not under their constraint. The rules and regulations being followed up by individuals are not hard and fast rather they are being appreciated well before the employee leas and then get into existence. Company should not enforce the individuals to follow every right that is very strict to follow rather they should consider to maintain moderate policies. Any individual appearing for the company if asked to submit few of the work details about their previous company then they should not feel offended or rigid. There are polices which is constraining the employees to work or perform the task they are being asked to deliver. Every policy is being made keeping in mind the need and deed of the company and such needs should get accomplished for the sake of growth of the organization. Policies are important and should be followed. Disclosing any such policy which can put them in some problem is not at all favorable. A person appearing before any interview should firstly prepare well and after this they should know the basic terminology that might be asked to them during the interview. One should answer every question very carefully and without giving any negative answer. Thinking before speaking is an important aspect that every individual should learn and this approach will help both the company and individual grow. Past experiences also plays a major role in keeping the individual appear for the exam. This is an important thing as the person should have a high character set at the previous company she might be working in and should simultaneously not be dismissed from her work zone. It should be the employee who themselves wished to switch from the company if they were not feeling satisfied or happy working. There should be no hiding of any information that may prevail to any conclusion and hence a past experience does matter. A person working hard at his workplace shows that the person is dedicated and will show full dedication in the work they will step in into. Showing dedication will help the other person to become more responsible and likeable by the company. The more they will understand the true nature of the employee, the most easy it becomes for the company to modulate changes to them. Showing a good nature will help the interviewer to hire them as they will be in need of an employee who would readily mix up well with other employees without facing any major problem. Often there are job specific job profiles that surrounds by the person who is responsible for handling the person or the staff working under them. The more efficiently a person will be in dealing with the people the more eligible she/he will become to get selected for that particular job profile. By keeping a healthy relationship with the people working will help an individual to grow. A person should be moderate and very adaptive. They should focus on things that comes to them and should be able to pay full attention and give their cent percentage in its proper completion. They should have a great attitude towards everything and should also remain eager to learn new things as and when it comes to them. They should be highly adoptive, it helps the company to shift them anywhere all over the different states their company exists. This is an important aspect which often ultimately helps the other person to grow. Systematically organizing different things helps to present an image that they are responsible and takes their job seriously. One should always be very keen and eager towards the things that belongs to us and hence should focus wholeheartedly towards the things that might help us to grow. By keeping things active helps in over all development. Loyalty is an important aspect as it keeps the other person gain trust on them. Loyalty is important as it helps in keeping the person grows and a loyal person tends to be more specific about their workflow. The more loyalty a person will show, the more there will be chances of them getting selected. Loyal people tend to be smarter and gains trust very easily. A trustworthy person tends to show more loyalty towards their workplace and hence are an eligible candidate. Loyalty and hardworking skills is a boom for the company as they work hand in hand. Smart workers are the need and deed of any company to have. A smart worker will tend to accept the security policies easily and will adopt them without any problem. They will be highly informative and thus growth of them is sure to happen. Smart workers are much more important than the normal workers as they are the pillar of the organization and they tend to make the entire security policies run according to their need. Smart workers are a boon for the company. Introducing new and advanced policies might be easy by the new and intelligent people to adapt. An intelligent fellow will serve the best for their company’s growth and this way they will focus in a better way for implementing the company’s growth and the growth of the individual as well. Intelligent people tend to be more specific as well as easy to work with. They will know what terms should be kept secure and what not. Being adoptive in critical situations is one such basic need of the company. By being adoptive what is being asked is that the person devoting their time in the company should adopt few of the changes that are being made. They should be eager and fast learner. They should focus on things that are meant to be changed within the duration of time or at least will be enhanced. Being highly adoptive is a basic need of the employees. Modularity is an important need of any employee to adopt. They should be highly focused and keep their policies and things regulated with the duration of time. They should be eager learner and should be low pitched. They should be familiar with the things around them and should be active learner when time comes. Being modulated helps the employee company relationship grow and helps keeping the secure policies secured. The term keeper often refers to the person who helps in keeping the things regulated and under controlled. A keeper will stick to the organization without keeping the other distractions affects her. They should keep the things regulated and should help the organization to mutually grow and understand the things in a better and organized way. A keeper will help keeping the people working for the organization and other people keep in touch. Security is the play which is why there are things and questions about the confidentiality. The more a person will feel secured the easier it will be for the other person to grow. Security helps the person to evolve and keep grounded at the same time as they will be authorized and authentication will be applied to them. They have to act more responsibly and the whole responsibility of the secured system comes under their hand. By being informative what is meant is that every employee should seek for the individual growth and not underestimate the information given to them. They should specially take care of the information coming to them and hence should act in accordance with it. They should keep the information given to them secretly and should not let any other thing disturb their mental peace of mind. By the overall perception what is being asked is one should be moderate, keen and should be adoptive enough to help every person regarding the company growth and evolve. An overall perception is an important aspect as it helps the individual to grow and keep the secured policies alive till the time one can. An Overall perception is the basic need of any company and focus should be making in its completion considering every possible aspect. In order to conclude this, one should be confident and at the same time should be down to earth when it comes to accepting the policies. Focus should be given on being active and productive and not on anything else. One should have a deep knowledge of the terms and conditions of the company and should focus on the upliftment of both while keeping the security issues intact and unaffected. The confidentiality of the company is very keen as it is the basis of any organization. One should focus on the things that affects the company and should act in accordance. Often the terms mostly used for the overall growth is also responsible to take them down. As there are many people working for the growth of the company one should also try to mark our presence by showing to them the trust and the respect we have for them.